Now, don't start changing my station. I admit. I’ve been a little out of sorts lately, and it’s more than it being August and all. It’s just — well — summer is almost over and I have yet to see my Praying Mantis. Until today! This morning, Joe and I packed up the truck with tools and a ladder to help my niece and her fiance repair their wood deck. When we arrived at their house, and unloaded the truck, I opened up the ladder — and there he/she was. My Praying Mantis, in all of his jointed glory. My niece’s fiance was impressed; he hadn’t seen a Praying Mantis in a long time. What’s a Mantis maniac to do? Hand over my Praying Mantis as a house-warming gift? Or, take my big-eyed beauty back home? Hmmmm, I pondered. Perhaps I needed to make like a Mantis and pray. What would Jesus do? What would a gardener do? What would Jesus do if He hadn’t seen His Praying Mantis in His garden for a long time? The answer was staring at me the whole time. I carefully held out a stick, coaxed the Praying Mantis to jump on, and brought my pet home where it belonged. 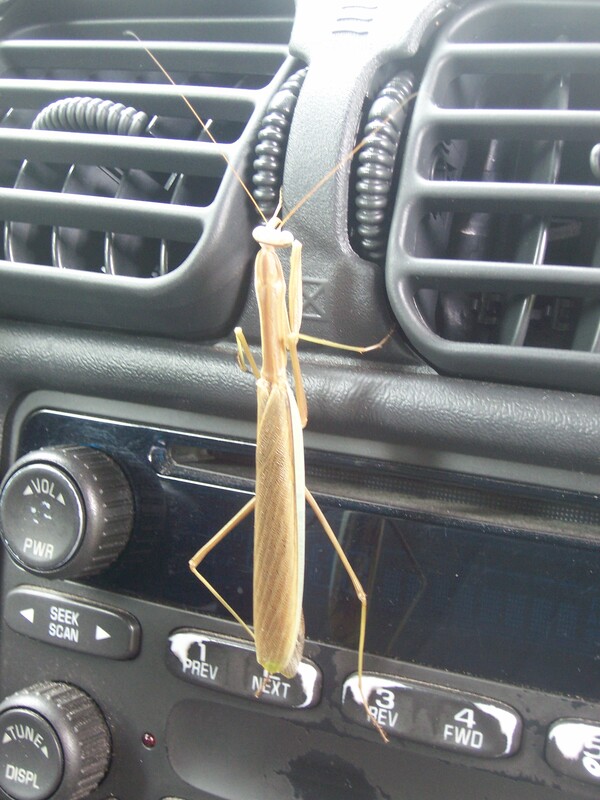 With the Mantis clinging to the radio, its antenna blowing in the airconditioning, it was Joe and Me and the Mantis — just the three of us out for a drive. I like to think that my Praying Mantis was, at that moment, a Smiling Mantis. Yes, I do consider this insect my insect. I first spotted my carnivorous cutie many years ago when I started the garden. I spotted him (or her) when he was an infant and watched him grow over the course of the summer. I took the Praying Mantis’ appearance as a sign that my new garden was a success. Either that, or I had invited a lot of pests into the yard and the Praying Mantis thought he had landed at a buffet table. Either way, the Praying Mantis has returned each year. Of course, I am aware that this cannot possibly be the same Praying Mantis, but I do find comfort in thinking that my yard is home to generations of Praying Mantes. Being able to see one of the coolest bugs on the planet, even at this late date, is like — well — an answer to my prayer. Have you ever seen the little bitty babies just hatched? Sometimes the eggcase is indoors, then I have to carefully walk them onto a bit of paper. Put junior in the garden. And go back for the next one. They are so small and just barely there ghost coloured. I have never seen them, but it sounds exciting. I’m tempted to order some egg cases and then release them in the yard. I think they’re fascinating! A very cute story and I am glad your mantis made it back home. Thanks. I’m glad you enjoyed it — although right now I’m hoping that the Mantis can swim. It’s pouring outside! Glad you stopped by. We are certainly happy to have our Mantis back home with us — oh, wait, when you say family, do you mean me or a tribe of smaller Mantes? Either way, those of us with wings and those of us without are happy to be together again. Thanks for commenting. The Praying Mantis is one of my favorite insects. It is always a thrill to see them in and around the garden. I, too, move them back to the garden if they find themselves in a place where harm may come to them. They are so incredible…I really like your photo on the car…really stands out! As long as he didn’t change the station or try to take the steering wheel or tell us to hit the drive-thru Starbucks on the way home . . .
Oh Blimey! If I found a bug like this in my vehicle I’ d have to sell it! AHHHHHHHHHHHHHH!!!!!!!!!!!!!!!!! The praying mantis looks like he was enjoying the music! I haven’t seen these in my garden. I would be as excited as you if I were so lucky! They really are a an other-worldly treat. 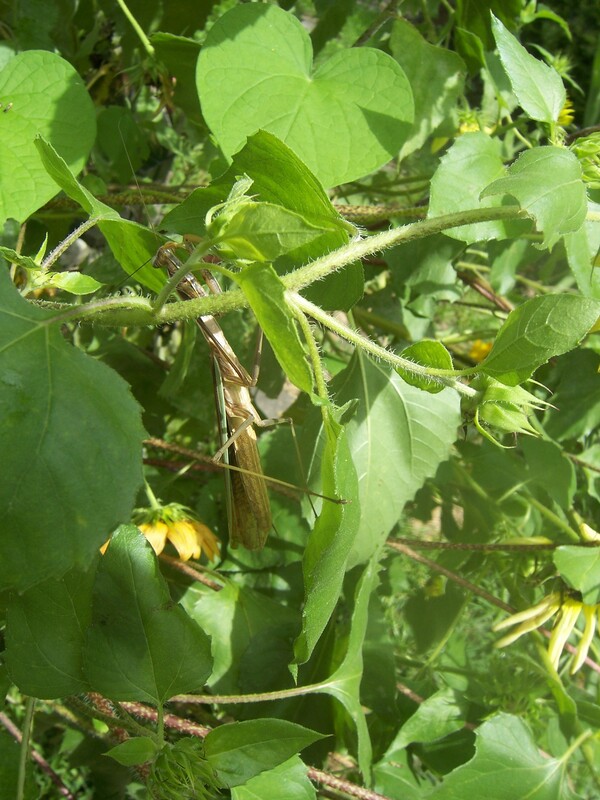 If you’d like a Praying Mantis in your yard, you can order egg cases, let them hatch, and then release them.